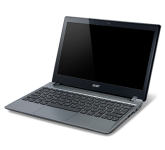 Aspire C series by Acer are notebooks with all the essential features at an undeniably affordable price. It’s faster, better, and lasts longer than its competitors in the market. Its simplicity, long lasting battery, and unique keyboard make it the ideal everyday notebook. Its Chrome OS operating system is little more than the Chrome Web-browser, with Web apps built-in and some added offline functionality. Upgrade your C series notebook today to improve functionality.